A TECHNICAL ERROR on an Air Lingus flight from Dublin to Malaga saw passengers delayed by more than 10 hours. The plane had been scheduled to depart at 7am this morning. Initially all 288 passengers boarded the plane and it taxied to the runway. However, soon after it became clear they would not be departing on time. Speaking on RTÉ’s Liveline programme with Joe Duffy earlier today, passenger Mairead O’Doherty said that the experience had been a “nightmare”. Guests travelling on EI 585 from Malaga please note we have an estimated departure of 22.30 local time. Apologies for the delay. Initially, individuals were made to wait in their seats for more than three hours while the plane was checked. O’Doherty had been due to spend four days in Malaga. “Whatever about us, there were older people and disabled people on the plane as well. They were really frustrated,” O’Doherty said. 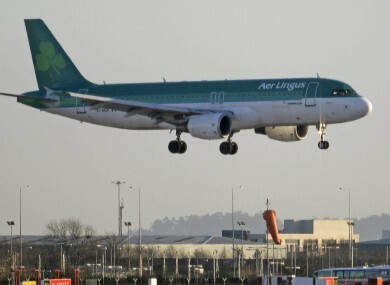 Aer Lingus has said that EL 584 has been undergoing inspections and maintenance by engineering staff. It said that all efforts were being made to find a replacement plane. The plane was finally due to take off at 5.30pm this evening. Prior to departure passengers had been disembarked and given vouchers to spend in Dublin airport. This follows two other incidents involving technical problems on Aer Lingus flights in the past week. On Saturday a flight was made to turn back on its way to Munich after fumes filled its cabin and yesterday another flight was made to turn around after a technical fault. Email “Passengers wait for more than 10 hours as technical error delays flight ”. Feedback on “Passengers wait for more than 10 hours as technical error delays flight ”.